32 Pound Gun 1805 "It's Big"
The main armament of the Victory, carried and fought on the lower gun deck, this gun was massive. It beggarrs belief that this huge weight of iron and wood could be serviced and then run out by muscle power alone. To imagine Hell itself, only requires consideration to be given to the lower gun deck on Victory during the battle of Trafalgar. Our model conveys a sense of this massiveness, particularly when seen against the other cannon. The model is well detailed and the cipher on the gun barrel has come out particularly well. 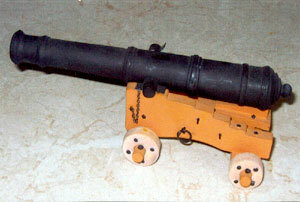 Our cannons are based on authentic drawings approved by the Curator of the Victory.